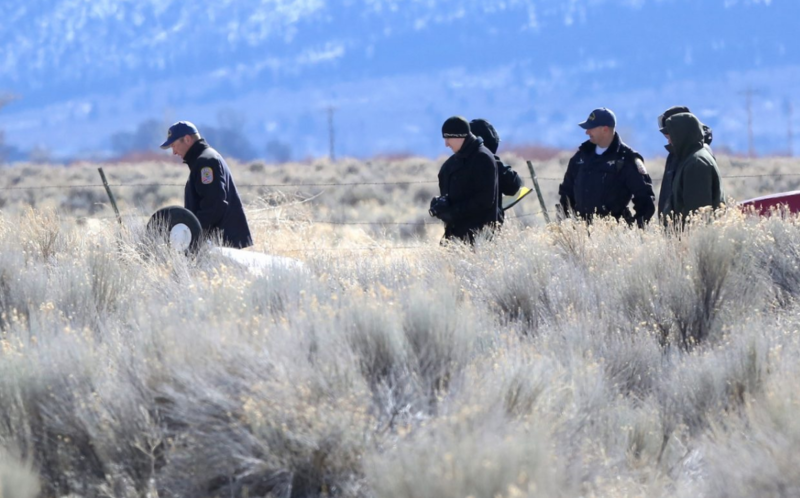 The wheel of a small plane is visible above the sage brush as rescuers work at the scene on Monday, Feb. 19. A 64-year-old Minden man was identified as the victim in a plane crash that occurred near Indian Hills on Monday. Stephen Filice was killed after the twin-engine Piper PA-34 Seneca he was flying crashed into a field at about 11:30 a.m.
Felice was flying the aircraft from Bakersfield to Minden. Sheriff’s Lt. Dan Coverley said Felice called for a local weather report before the aircraft disappeared from radar and radio communications. According to the Douglas County Sheriff’s Office, one caller reported seeing smoke coming from the plane as it went down. Witnesses also reported seeing a piece of the aircraft fall off. The aircraft may have been circling in preparation for landing at Minden-Tahoe Airport. East Fork firefighters and sheriff’s deputies combed northern Carson Valley, and a Care Flight rescue helicopter flew over the area, in search of the wreckage. Filice was found with the aircraft, which was located upside down in a field on the Washoe Tribe’s Stewart Ranch about 45 minutes after the first report. The scene was turned over to the Federal Aviation Administration and Douglas County Sheriff’s Office. According to the Federal Aviation Administration, the aircraft involved in the crash was built in 1978 and was not due for recertification until 2019. The aircraft is registered to Stunad LLC out of Stateline. Filice owns a home in Wildhorse that has been in his family since 2015.